A former employee of the controversial political consultancy, Cambridge Analytica has named the DUP on a list of pro-Brexit groups. Christopher Wylie claims those groups were working together according to a “common plan” at the time of the EU referendum in 2016. He was addressing the Commons Media Committee on Tuesday. 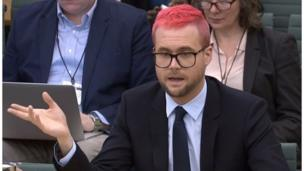 Mr Wylie described a Canadian digital marketing firm Aggregate IQ as a “franchise” of Cambridge Analytica. However, lawyers for Aggregate IQ have said the firm had “never entered into a contract with Cambridge Analytica”. They added that it had “never knowingly been involved in any illegal activity”. Mr Wylie claimed a number of groups had worked together in order to get round campaign spending controls. He rejected Cambridge Analytica’s assertion that it is not linked to Aggregate IQ. 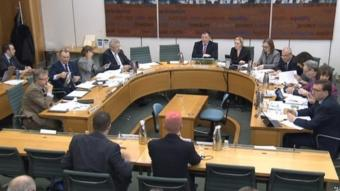 Christopher Wylie giving evidence to MPs on Tuesday. During the EU referendum in 2016, the DUP spent £32,750 on marketing with Aggregate IQ. They employed the firm again during the Assembly election campaign of 2017, declaring more than £8,000 in digital advertising. The DUP said they declared all expenditure as required with the Electoral Commission, and chose Aggregate IQ because the firm is expert in its field. It’s understood the Electoral Commission is investigating the Vote Leave campaign for alleged breaches of the EU referendum campaign spending rules. However the commission says the DUP is NOT under investigation. A former Leave volunteer, Shahmir Sanni, has claimed that the Vote Leave campaign exceeded spending limits in the referendum by co-ordinating their activities with other like minded groups, including “BeLeave” a group targeting young voters. Mr Sanni says Vote Leave gave BeLeave £625,000, but required it to spend the cash on Aggregate IQ. This kind of coordinated spending would have contravened the campaign spending rules. Vote Leave have denied accusations that they broke the spending rules during the UK’s 2016 referendum on whether or not to stay in the European Union. In the Commons, the Labour MP Ben Bradshaw accused the DUP, Vote Leave and other groups of “collusion”. 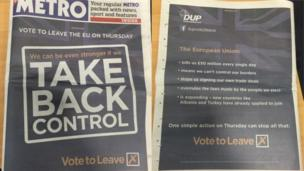 The DUP’s ad appeared in wraparound in London’s free Metro newspaper. In contrast to BeLeave, there is no suggestion the DUP received any money from Vote Leave. Last year, it was revealed that a Scottish-based group called the Constitutional Research Committee had donated more than £400,000 to the DUP during the EU campaign. The money was used for a four-page wraparound advertisement in the “Metro” newspaper and other expenditure including Aggregate IQ’s online advertising. Previous Previous post: Wee Ian Paisley (og) #EnoughisEnough – with his UDA friends flying the ‘Star of David’ flag alongside the UnionJack – Are you having a laugh?